Airport Mania: First Flight is rated 4.4 out of 5 by 27. Rated 5 out of 5 by malibuhanna from Fun game I cant stop playing it! I bought it a long time ago, but sometimes im scrolling down my game list to see what game im in the mood for, and air mania pops up again. The levels can be quite challenging at one point. You can skip the tutorial when you play it for the second time. Rated 5 out of 5 by marjoann from One of the best games ever! Love this game! I'm so waiting for the Airport Mania 3!! Rated 5 out of 5 by LadyoftheIvy from Very cute! This game is a lot of fun for both adults and children, and it's just really very cute. Basically, your job is to land different kinds of planes at different airports, preferably before they get too angry and leave. And much like any time management game, you have to reach at least a certain goal to complete the level, with higher goals leading to higher ranks. The thing that makes this game so cute are the planes themselves - they all have faces and make different expressions depending on their mood at the moment, what they're doing, etc. They also make cute noises and sounds. The graphics are cartoony, but nice, and the sounds are enjoyable as well. There's also various extras in the game (different things you can click on for little amusing comments or actions, for instance) which are a neat addition. It's not the world's hardest game, but has enough challenge to keep most time management fans interested. However, it's also easily enjoyed by those who aren't experts at time management games as well, as generally the basic goal is pretty easily obtainable. It's nicely replayable, too, which is great. Both my children and myself have gotten a lot of enjoyment out of this game, and I'd highly recommend it! Rated 5 out of 5 by PerfectDark808 from Very addictive and fun game! I love this game and the second one also. I hope they make another one. I've played them both and I do have to disagree with brookings about being unable to achieve supreme scores on all levels because I did it. Sometimes it is hard to keep those bigger planes happy but it can be done. This is a very entertaining time management game. Rated 5 out of 5 by brookings from A fun game It's impossible to get a surpreme rating on all levels. 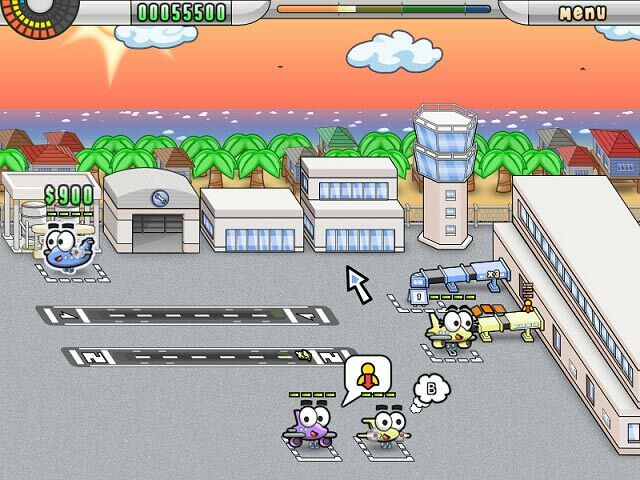 This game takes you to different airports where you are the traffic controller. Some of the small planes are so cute, they hum, and some of the big planes get mad if you keep them waiting to long to land or take off. I played this game many times and still enjoy it. Rated 4 out of 5 by amylmenke from Cute game This is a cute game. Not one of my favorites but I come back and play it again from time to time. A nice challenge on some levels. But not too hard to advance. Rated 4 out of 5 by tchaiki from Adorable but steep learning curve Disclaimer: I'm not a huge fan of all the "Diner Dash" type of games, so I may not be the target audience with this game. This game is adorable. The whistling and singing of the planes while they load, unload, and refuel is enough to make anyone smile. 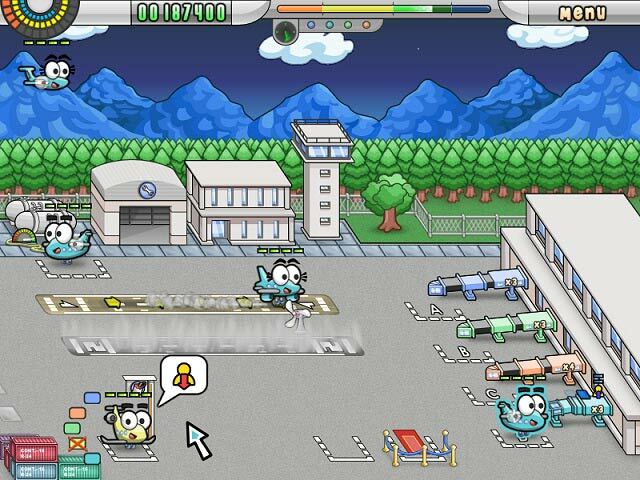 The mechanics of the game are similar to the basic Diner Dash type of time management games, but the cuteness of the smiling planes makes this unique. My only complaint about this game, and the reason I marked it as four stars, is that the difficulty level jumps from easy-enough-to-be-almost-boring to no-way-to-get-supreme-score. I don't mind that it gets difficult at the end, but I wish the progression were a bit more gradual. With the simple graphics, this is a perfect game to appeal to younger players--but the level quickly becomes too much. I'm not sure how many adult players enjoy this game, but even as an adult this game became hard on my clicking/mousing finger. Rated 4 out of 5 by mrm2006 from Ok I guess It was a very cute game without a lot of challenge. If it weren't for the reading part, my granddaughter could probably have handled it very well (she's 6). My son is studying aviation and avionics so I'm learning more than I'd like to about what exactly makes up a plane and makes it fly so lately I'll stick to the ground and play with the cute chubby planes on this game. Too simple for me. I do occasionally like the brainless simple games but this one goes beyond by being overly redundant and simplistic. And what is the storyline anyway? Rated 4 out of 5 by alsteele28 from You are the Air Traffic Controller! This like the second version was one of my faithful 'go-to' games on the PC, I still have this version and play it a lot on the tablet, and I think (for my own preference), that as this game is slightly older, it probably now lends itself better to either an older PC, or a tablet (any tablet), as as the graphics are a bit 'clunkier' then this (with reference to my PC), made the controls also slightly 'clunkier' thus sometimes I could not always control the planes as smoothly as I needed to, to get the 'supreme' score. That aside this is still a good game and if you have a slightly older PC which is maybe running XP-Vista, then this is probably going to run well. The game-play is almost identical to the second game, and whilst I prefer the second game (read the review of that for why), this I would still recommend to people who have an older PC (though if you have a tablet, try it on that as it will probably be cheaper (sorry BF), but I have both versions for my Ipod and I am going to purchase the second for my PC, the reason is that the intemacy on the tablet is good sometimes you just want a bigger screen to play on. 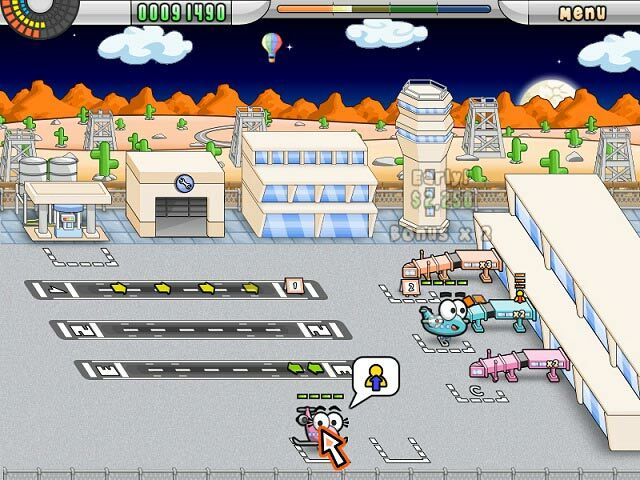 I would recommend this game if you want a stress free time management, where YOU get to be the Air Traffic Controller! Rated 4 out of 5 by MariaSweatfield from Fun Fun Fun!! I bought this game on CD rather than through BigFish, but had so much fun playing it I had to download the trial to the second one. Very fun, with planes that have attitudes that you need to keep satisfied before they fly away. I don't agree with the statement about not being able to meet all the Superstar levels... I did it, and more than once. I think my favorite part is where you get to paint the planes... I had one that ended up painted three different times before I could get it to a matching gate, and to keep it from getting irritated from sitting too long. Rated 4 out of 5 by Pucktweety from Very fun! This is a very simple yet fun and addicting game. The graphics aren't overly fantastic but they are cute in a cartoon-like way. The hidden fun bits when you click around the scenary is another added fun bonus! The game itself is very fun to play and gets rather challenging towards the end but still stays an easy to play game all the way through. One thing I did not enjoy is how in each place you where 'put back' so to speak so everything got easier again. I like games that progress in each level, not go back to easy and then get harder again. Rated 3 out of 5 by chagen521 from Good Concept I thought that I would try Airport Mania because I saw it and thought it sounded like a really cool concept. I played through quite a few levels and it was fun for the first few but after that they did not really introduce anything new to do in the levels. It was just more of landing the plane and dropping off the passengers, refueling, and sending them back into the sky. I played through the whole first location and about half of the second and it was still just more of the same thing. The planes are cute and sing songs as they land and things but other than that I found the game to be boring. I know there is a sequel and maybe that one is better but I am not going to be the person to try it and find out. Rated 3 out of 5 by kostar from Addicting but a lot of the same thing I found this game to be fun and somewhat addicting, but I was a little disappointed that every level was more of the same thing. The game didn't really add new things nor get more challenging as you went. I kept hoping that new challenges would be added, but I still enjoyed it. Once you finish the basic game, you are given access to Paper Planes, which is exactly the same game with paper airplanes instead of cartoon planes. I recommend this game for mindless fun, but not if you really want a challenge. Rated 3 out of 5 by LionessGrl from It was alright I only played the demo but that was enough to show me how cute this game is. It reminds me of a little kids show that has humming/whistling planes. It is very cute. There are eight airports each with seven levels. On each level you can get up to three stars and it is said that it is impossible to get three stars on each level. This game has so much going on for it from time management skills, to riddles, to different awards. Sometimes it seems too much but if you take each one at a time it gives you more play time as well as more stuff to do. One thing I did not like was how the planes will take over and go to a spot you didn’t tell them to. I am not sure if this was meant to sabotage you or if it is part of the game; either way I found myself getting so angry I was thinking about quitting. It also got pretty boring with the lack of new stuff to do as well as the lack of customization for the player. I kept looking at the clock hoping my hour was up. I am not going to buy this game for these reasons; for me it just wasn’t worth it. It seemed that the creators had more fun of a time with the graphics, and the planes than thinking of what the players would want. Rated 3 out of 5 by spicyanimechick from good first game had fun mainly the comments when clicking the buildings.